In what may come as a surprise, the Australian Defence Force (ADF) is now prohibiting Christian soldiers from practising their faith, even when not in uniform or on duty. It was certainly a surprise to me — not so much because I have served this nation while being a practising Catholic for more than 16 years, but because it was written in black and white in a letter from the Chief of Defence Force (CDF), General David Hurley. It was titled Notice to Show Cause for Termination of Appointment. In a more recent letter, the CDF stated that he accepted I had served well since 1997 in both permanent and part-time capacities. He also acknowledged that I had performed well on operations, received the US Meritorious Service Medal, was a competent officer with Arabic skills, reported well, was cordial in the workplace and had been cleared by Defence in both administrative and disciplinary investigations. Unfortunately, it was in a letter titled Termination of Service Decision. In it, the CDF concluded my retention was not in the Army’s interests. My crime was not to perform badly in the workplace. In fact, the ADF has not allowed me to participate in any Defence activities for a year because the leadership believe my personal political activities to protect the right of Christian schools not to hire homosexual teachers are offensive. Therein lies my sin: I have offended the Defence Force Gay and Lesbian Information Service (DEFGLIS). The fact that this organisation exists probably comes as a surprise to many, and quite possibly a shock. It has been given command of Australian soldiers speech, even when out of uniform, and Defence flies its members to international military conferences promoting homosexuality. It campaigns politically to remove freedoms and funding from Christian schools, with the specific aim of forcing them to hire homosexuals. But it does not just confine itself to that issue. The DEFGLIS Chairman, Squadron Leader Vince Chong, appeared before a parliamentary committee to support homosexual marriage. He was given this opportunity precisely because of his role leading this Defence-backed lobby group. He even received a Defence Force commendation, not because he was good at his job, but for his activities managing DEFGLIS and its political campaigns. How times have changed since I signed up as a bright-eyed and cheery teenager to serve this nation. When I joined to protect the freedom that Australians enjoy, I never imagined facing the sack because I expressed Catholic beliefs that a not-yet-formed, Defence-supported, homosexual lobby group would find disagreeable. The only reason that DEFGLIS has such an influence over my career is because the ADF has allowed itself to become politicised and politically correct. Defence leadership have formed the view that wherever there is a clash between Christian values and homosexual political activism, the latter will prevail. Christian members can serve today, but only if they are silent. Going by this trend, chaplains will be pulled tomorrow. By Friday next week, Christians will be banned, around the same time it becomes compulsory to wear the Army’s new cufflinks that proudly display the revered Rising Sun emblazoned over a rainbow backdrop. OK, I’m kidding about the timeline — but I do not jest about the Army’s new and freely issued jewellery. The cufflinks came out late last year, the same day The Australian reported the ADF had briefed the new Abbott government about a funding shortage. 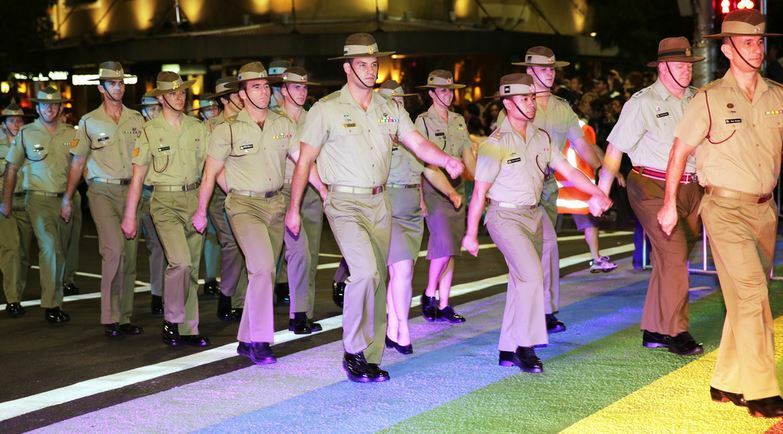 There is no greater example of this politicisation than in the ADF’s decision to allow uniformed participation in the Mardi Gras (below). This permission grants homosexual members dispensation from rules that all other ADF members must follow regarding political activity and unacceptable behaviour. Defence policy on political activity clearly states that members are entitled to join political parties and express political views, but not as Defence members. Uniformed political activity is rightly banned. That means that I can campaign against homosexual marriage, but not in uniform. Nor can I presume to speak on behalf of Defence while doing so. However, DEFGLIS has not only convinced the CDF that my personal activities in that regard are homophobic, but that I should lose my commission as a result. But that is not the extent of the problem. The constitution of the Sydney Mardi Gras states clearly that a key object of the parade is political activity. Defence personnel marched, in uniform, with Labor, the Greens, Australian Marriage Equality and even the Wikileaks Party, who were campaigning for Julian Assange, the man holed-up in the Ecuadorian Embassy in London for releasing classified documents. Conservative parties and politicians are routinely and roundly ridiculed and abused by the Oxford Street paraders. It is blatant hypocrisy for the ADF to tell Christian members that they cannot conduct private political activity, while allowing homosexuals the opportunity to campaign in uniform. Unfortunately, despite concerns over this politicisation, this is not the greatest problem with uniformed involvement at the Mardi Gras. There is currently a Royal Commission into child sexual abuse. Defence is hypersensitive to sexual scandals. Yet it allowed homosexual members to march in solidarity with groups whose official Mardi Gras description informed the public that they were sexual perverts. Soldiers marched with groups of almost entirely naked men who performed lewd, sexual acts in front of watching children. It is a breach of ADF computer usage policy simply to view the official Mardi Gras website. Its image gallery shows photographs of Defence personnel alongside pornographic images of other Mardi Gras participants. I detailed graphic evidence of this in an internal Defence complaint, highlighting that ADF policy forbids sexually explicit activity in its workplaces, activities or social functions. I also presented evidence that Defence insulted Christians by marching with homosexuals carrying signs stating ‘Jesus is Gay’. However, this was trumped by a one-page, unformatted complaint DEFGLIS lodged against me, alleging that I was homophobic. The DEFGLIS complaint was elevated to a high-level investigation under Defence (Inquiry) Regulations 1985. My 26-page document was dismissed on the basis that I had provided no evidence. In the new age world, pictorial evidence that Defence personnel supported homosexuals engaging in sexually explicit behaviour in front of children is trumped by allegations of homophobia. Months later, via Freedom of Information, I discovered that Defence’s only comment on my evidence was that it would not be good for PR if personnel marched with groups carrying signs stating “Mohammad is Gay”. I was also charged with 12 counts of breaching military law. The logic was that I had brought the military into disrepute by pointing out that its members marched in a sexually explicit parade. Although Defence disciplinary and administrative investigations eventually cleared me of all wrong doing, it is of little comfort. The CDF is pursuing termination of my commission anyway. In the same letter in which he limited my rights to practise my faith, General Hurley wrote that rather than placing any “significant weight” on whether or not I had “technically breached” Defence law or policy, he would give greater weight to his own view that I was demeaning of homosexuals, transgender persons and women. This was even though a Defence inquiry had cleared me of those allegations, as put forward by DEFGLIS. I wish to continue serving in the Australian Army. I am proud of my service and of what our military should be. I do not intend to lose this battle, but I also believe in Divine Providence. To paraphrase the words of the great American comedian, Bob Hope, the ADF has just made homosexual political activity legal, maybe it’s better I’m kicked out before it becomes compulsory. Bernard Gaynor’s complaint is long on emotion but rather short on the sort of detail necessary before an informed judgement can be made as to whether he’s been treated fairly or not. He reports that he has been issued with a show cause letter by the Chief of the Defence Force. Things may have changed dramatically for the worse in the years since I retired from the ADF, but for such an issue to have reached Four-star level would suggest that the decision did not come down from the clear blue sky. In the normal course of events, Gaynor would have had several opportunities to put his case within the ADF system, including the redress of grievance process through his commanding officer, and higher commanders at (probably) Two- and Three-star levels. Again, unless things have changed dramatically for the worse, he would still have had recourse to the Defence Force Ombudsman and to the Minister via his Member of Parliament or directly. I suggest that there is much more to this than Mr Gaynor is telling us.